São Paulo’s MobiLab shows how cities can empower citizens to create mobility solutions through opening data and supporting innovation. Photo by Igor Schutz/Flickr. São Paulo’s transport systems generate 30 million data points every day, an amount that exceeds even the city’s 23 million daily trips. Using this data to improve urban mobility is a challenge, but also a key opportunity for cities. That’s where MobiLab, São Paulo’s laboratory for urban mobility solutions and winner of the 2014 City/State MobiPrize, comes in. Ciro Biderman, CEO of São Paulo’s public transit operator SPTrans and the leader of MobiLab, received the award in Detroit during the ITS World Congress led by Bill Ford, CEO of Ford, and Robert Safian, editor in chief of Fast Company. Biderman spoke with TheCityFix Brasil about how open data and technology can transform the way cities are planned. In particular, he discussed the main challenges facing São Paulo – Latin America’s largest city – and how the city is using technology to address them. 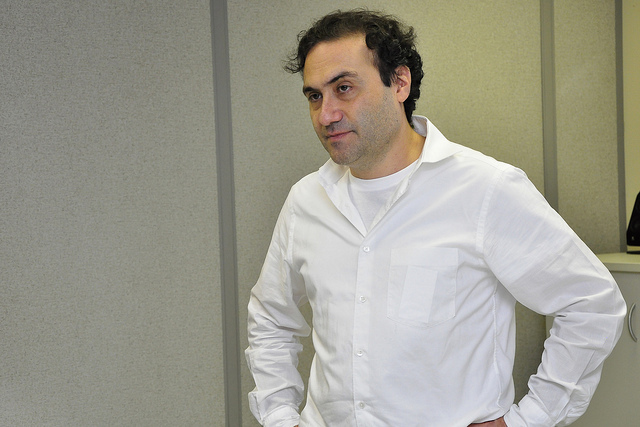 Ciro Biderman (CB): MobiLab is an open data laboratory for urban mobility that aims to move beyond the traditional way governments achieve solutions through technological innovation. The traditional method works like this: to address an urban problem, the government hires a large company that usually provides an expensive and time-consuming product that partially solves the problem. This solution is monolithic, meaning each new challenge will require a new hire whose changes are expensive and time consuming. MobiLab’s model is focused on small groups applying quick, simple solutions using openly available data. We have partnered with the University of São Paulo (USP) and start-ups, which are more dynamic and transparent in their work. How is the lab organized? CB: We have two business arms: working groups and an incubator for start-ups that will create mobility solutions. We already have five working groups that consist of between six and 12 people. Each group pairs members from the Company of Traffic Engineers (CET) and SPTrans with students at various levels, ranging from high school students to doctoral candidates. These students come from specialized, technical high schools, and work day to day on solutions with guidance from their teachers. We plan to launch the start-up incubation program in November, if all goes well. We will select ten companies to work in our laboratory. In addition to having access to the workspace lab, technical assistance, and mentoring, the companies will have access to all equipment and city data from traffic signal controllers, electronic parking meters, bus GPS systems, and more. For companies that wish to participate in the program, we intend to announce the launch broadly through the CET, SPTrans, the City Hall site, and local media. How does the open data policy impact urban mobility in São Paulo? CB: I believe São Paulo is the first city in Latin America to open public transport data to the public. Open GPS data from bus systems updates every 85 seconds, and has encouraged the creation of 60 applications. These allow users to see when their bus will arrive, plan their trips, and more. Portland, United States is an example of another city that opened its data to the public in 2006. As we release more data, a number of advancements may occur. Our incubation process aims to help companies take advantage of open data to produce solutions and tools for urban mobility. From a social and democratic point of view, open data also increases transparency. The more knowledge the public has, the better it can demand services from the government. Ciro Biderman, CEO of SPTrans. Photo by Mariana Gil/EMBARQ Brasil. 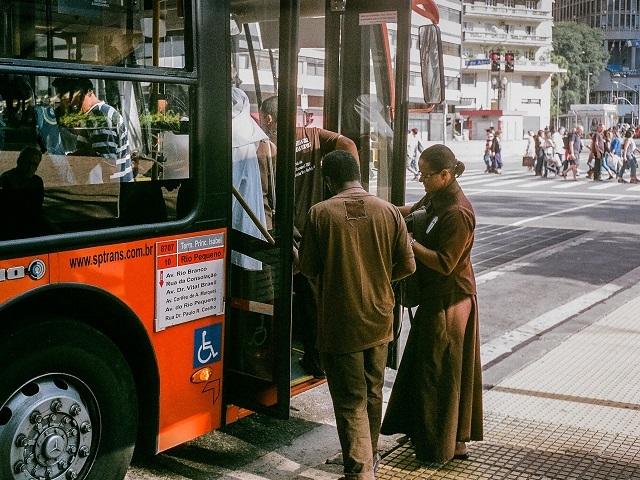 From a technological point of view, what are São Paulo’s main mobility challenges? CB: I see a number of challenges with regard to the role of technology to improve urban mobility. We have 30 million data points generated per day, so we are talking about a massive amount of information generated per year; there is a challenge in making use of this big data. For example, using GPS data – a focus of the working groups – creates the potential to monitor transport services. Are vehicles leaving stations on time? How far are they traveling? Are they able to stay on schedule? To process, organize, and analyze all available information is difficult but rewarding. We can similarly analyze individual transport using radar data. The data for cars, motorcycles, and trucks is precise enough to create an origin-destination survey using license plates and the vehicle’s place of residence (while maintaining anonymity). We can even accurately estimate the speed of runners using radar data. Tracking these trips is another challenge that we would like to address with data. We currently track this information manually, which is more labor-intensive, expensive, and potentially less accurate. Another challenge is how to ensure in transport concession agreements that transport systems embed technology in accordance with the open data policy. Right now, we have protocols that cover the cost of GPS on multiple buses up to R 2,000 (US$ 835), while a new GPS system costs R 400 (US$ 167) each. How can we ensure information is made publicly available? What else do we need to add to the vehicles? Wifi? Speakers systems to ensure universal accessibility? It’s essential to know the cost of all this when deciding what is feasible. Ensuring that embedded technology meets certain standards is a major challenge. Contract fines are also handled manually, and automizing this system would be another way to increase efficiency. What are the challenges for cycling infrastructure? CB: We have an aggressive policy to prioritize bike paths in São Paulo, but we still know little about them. In household origin-destination surveys, there are so few bike trips that we do not have accurate data. A working group is focusing on developing solutions to improve data collection on bicycling, and also on accessibility to transport services. For example, the group is working to improve placement of audible traffic lights for the visually impaired. They plan to build a website and app that allows the disabled to contribute information that will improve the city’s understanding of their needs. Click here to learn more about MobiLab. This article was originally published in Portuguese on TheCityFix Brasil.